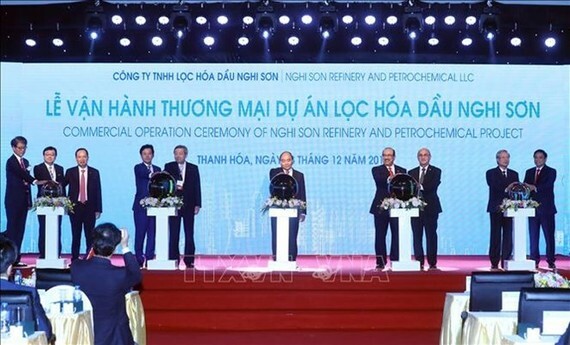 The Nghi Son oil refinery and petrochemical plant in the north central province of Thanh Hoa officially began its commercial operation on December 23. “The commercial operation of the project is significant to the national development in terms of politics, economy, society, security and defence and contributes to ensuring national energy security,” Prime Minister Nguyen Xuan Phuc said at the launching ceremony. The commercial operation of the plant marks a breakthrough development in the country’s oil refinery-petrochemical sector, he said. Together with the Dung Quat oil refinery in the central province of Quang Ngai, the fuel provided by Nghi Son will meet about 80 percent of the domestic demand, thus reducing dependence on imports from foreign markets, he added. So far, this is the biggest project in Vietnam regarding construction scale and total investment. The project is a symbol of international cooperation that received special attention and support from the Vietnamese government and its important partners – namely Japan and Kuwait, the PM said. It helps create a skilled workforce, serving as a “nucleus” for the development of human resources in the region, he said. The government leader highly valued the warm support of people from Tinh Gia district in Thanh Hoa to hand over their land for the construction of the plant. He asked Thanh Hoa authorities, the Vietnam National Oil and Gas Group (PetroVietnam), the management board of Nghi Son Economic Zone, and the Nghi Son oil refinery company to continue taking good care of local lives. ”The commercial operation of the plant is an important event, marking a big milestone in the socio-economic achievement of Vietnam at the end of 2018”, the PM said. The Nghi Son oil refinery and petrochemical project has been carried out since 2013. It is invested by PetroVietnam (25.1 percent), Kuwait Petroleum International (35.1 percent), and the Japanese firms Idemitsui Kosan (35.1 percent) and Mitsui Chemicals (4.7 percent). The plant is located at Nghi Son Economic Zone – one of the key coastal economic zones and a national key location of oil and gas. With a total investment capital of nearly US$9.3 billion, the plant is a world-class deep processing petrochemical complex using the most advanced technology with the full capacity of 200,000 barrels of crude oil per day in the first phase. At present, the plant has successfully produced 10 kinds of petrochemical products. As of December 2018, the plant processed around 5 million tonnes of crude oil and contributed over VND8 trillion to the State budget. As planned, when reaching its full capacity, the plant could process 10 million tonnes of crude oil per year, meeting 40 percent of the domestic fuel market. Nearly 17 percent of the petrochemical products will be exported to foreign markets.